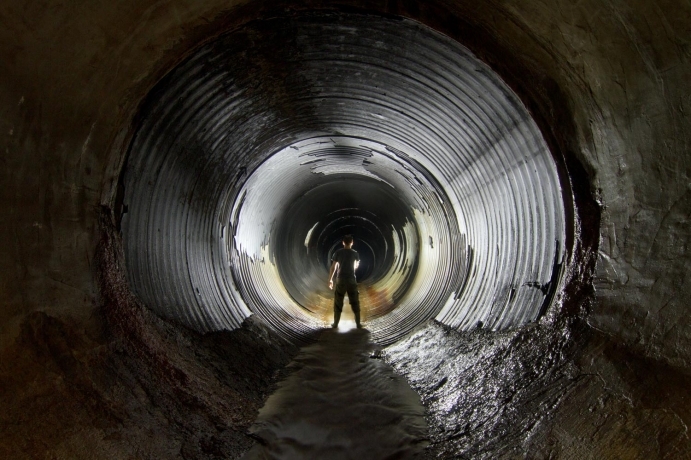 North York Storm Trunk Sewer, Toronto, 2013. Despite what my photos may lead you to believe, much of Montreal’s underground is actually quite mundane. 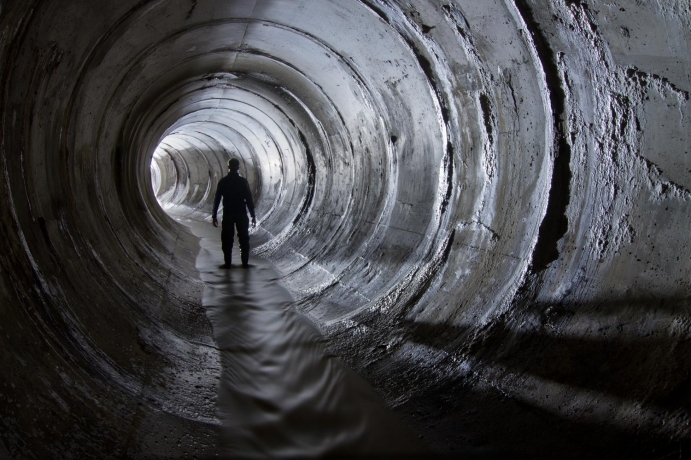 Unlike the world at street level that’s feature-rich and full of endless distractions, the sewers of Montreal are visually repetitive. They tend to be unkind to those who don’t possess a certain temperament for long slogs through water mixed with human and chemical waste. During my visits underground, I tend to photograph the most unique features or at least the ones that I feel work well photographically. Looks are deceiving though. What this visual record tends to leave out are the long spaces in between where there’s nothing particularly noteworthy. These photographs also dramatize the space through the use of lighting effects and long exposures. Take away these elements and what you’re left with is a pipe between four and fifteen feet in diameter with varying amounts of water flowing through it. Sometimes the construction material and the geometry changes, but these are the basic elements that one is faced with. As a photographer, I’ve struggled with the limitations of what can be done using these minimalist surroundings. It’s part of the reason I created this site. I wanted to do more than simply take a photograph and write the occasional caption. This site helps address what photographs fail to do: explain. They do a far better job at describing, and while this limitation can often be a good thing by adding layer of ambiguity and mystery, it’s can still be frustrating. I’m sometimes envious of my wife, a writer, who has at her disposal a multitude of literary devices from which to choose from. Through words, writers can show and tell, though they are often discouraged to do the later. Photographs, on the other hand, can only show and describe what the camera recorded at that particular moment. According to Jeff Wall, the photographer Walker Evans once said, “There is no novel that isn’t a book of photographs.” While this may be true, the inverse doesn’t sound nearly as convincing. It’s hard to say that all books containing photographs are like novels. “The Drain” by Jeff Wall, 1989. That’s not to say that there isn’t some crossover between literature and photography. In my other series of photos, such as the ones taken in former industrial locations or in Athens, Greece, I had more opportunity to introduce elements of irony, metaphor and humour. Through the sequencing of photos, I could further construct some form of narrative or develop an overarching statement. Through various techniques, I could create a multifaceted body of work open to interpretation (at least that was the goal). But I find that a pipe is limiting, and no matter how much I enjoy the experience of being underground, I always feel like I’m hitting my head against a brick (or more frequently, concrete) wall. 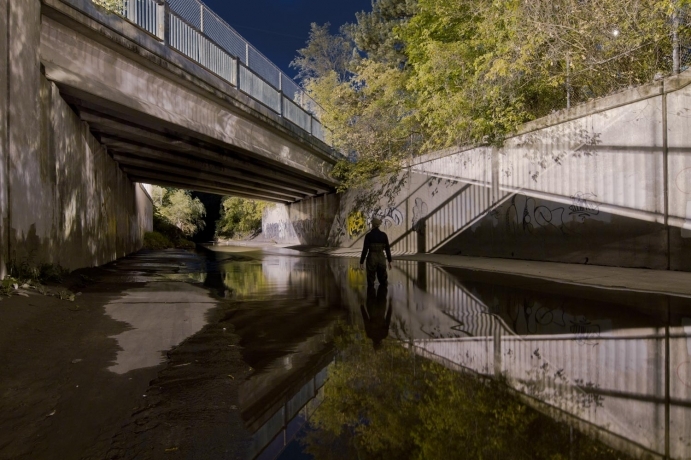 In 2012, I had the opportunity to explore the theme of Montreal’s sewers and former creeks after being asked to create an art installation for the city’s annual Nuit Blanche event. I was given two spaces to work with, and by collaborating with sound artist Samuel Thulin, I developed an experience incorporating photography, video and audio in a way that felt liberating. This past year, in 2013, I was asked to create content for the video screens situated on the station platforms of Toronto’s subway system. 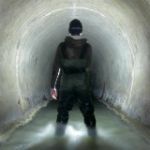 I decided to explore the city’s sewers and former watercourses through animations built using hundreds of photographs. It was, again, a way to get around my own feelings about the limitations of single images taken underground. I’m now back living in Toronto. 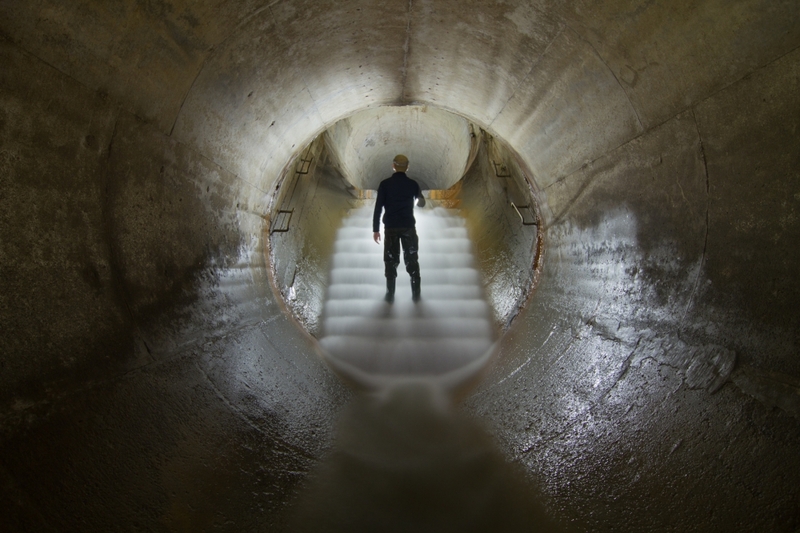 It’s a city that, like Montreal, has a complicated history involving water, sewage and infrastructure. When I arrived I thought it would be a good time to change gears, to not concentrate on water systems beneath the city, but those found at ground level. I’m particularly taken with this city’s creeks, especially the ones that have been transformed through engineering. Many have had been heavily modified through a process known as channelization. I only photograph these places at night and unlike the sewers of Montreal, I’m letting the light of street lamps, buildings and occasionally the moon expose each scene. With this approach has come a new set of challenges, like how to stand motionless for several minutes at a time with mosquitos biting at my arms or how to work around the presence of coyotes. Despite this, I’m enjoying the luxury of having more variables to work with, such as the vegetation which has, over time, found a way to reintroduce itself after having been cleared decades ago. 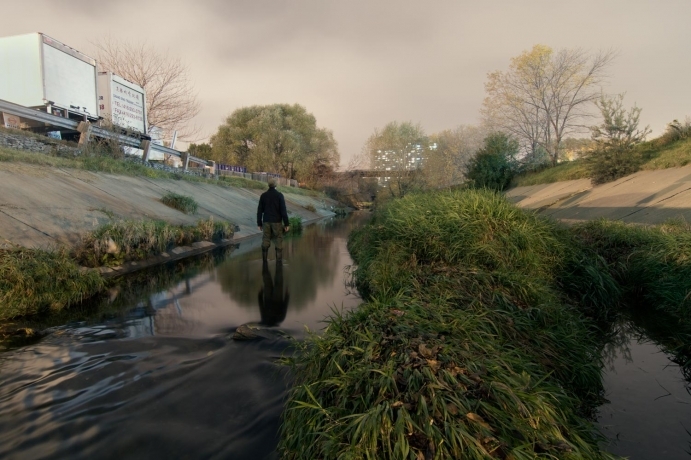 I enjoy having this new and often surreal landscape in front of me to work with, but most of all, I enjoy the tranquility of it all, of being out at night by myself, of white noise from the city mixing with the sound of flowing water. 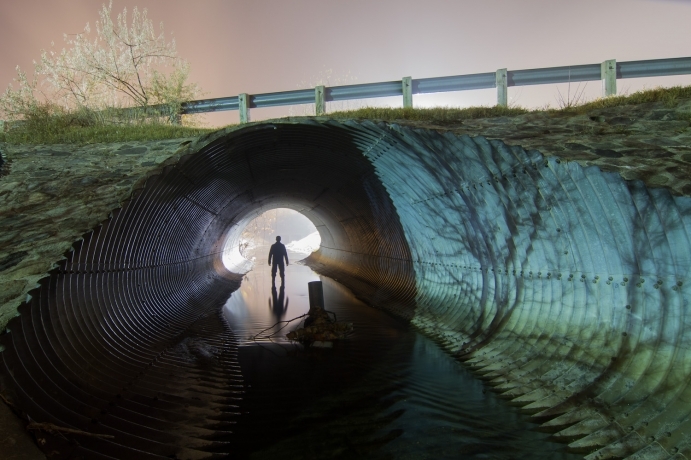 In the sewers, there comes a peace from the feeling of being physically disconnected from everything above you. Here, there’s a different kind of peace— one that comes from feeling more mentally connected to the things around you. The photographs I took in Montreal, many of which appear on this site, were taken in a whirlwind of passion and obsession. I threw caution to the wind and probably wouldn’t have made it very far had I not possessed a certain degree of recklessness Much of my photography in the past has dealt with subject matter unfamiliar to me. As I get older, I find myself gravitating back to places not unlike ones I grew up near, places that used to be my stomping grounds. As a teenager in suburban Ontario, I took photographs alongside streams in the fields and wooded areas left standing adjacent to industrial parks and subdivisions. Today, I find myself in similar landscapes no longer pristine, but still notable for their quiet, space and beauty— places that even in the dark of night feel close to home.